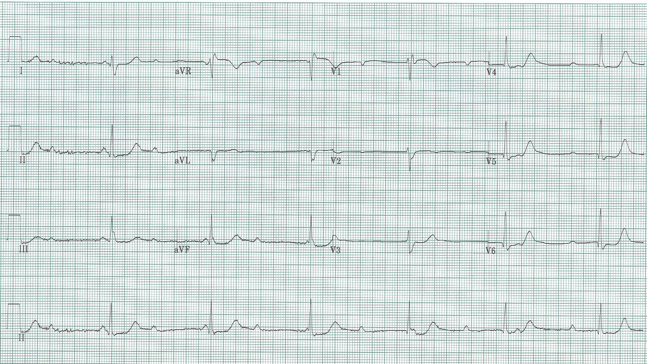 48-year-old man with this EKG after bradycardia was noticed in the PCP office. This middle-aged man is a landscape worker in Massachusetts and frequently encounters ticks that he “burns off with a cigarette”. He vaguely remembers a “large round red rash” during the summer. Currently he has no complaints but was noted to be bradycardic at a routine PCP office visit. Rate and rhythm – narrow QRS complexes at a regular rate of 45/min, with P waves at a regular rate of 72/min; the P waves and the QRS complexes are completely dissociated – this is 3° AV block, or complete heart block. Notice that the rate QRS complex is 45/min and the complexes are narrow-complex – this implies that this “escape rhythm” is high in the progression of possible escape locations, probably just below the AV node. This healthy middle-aged landscaper was diagnosed with Lyme carditis with AV node involvement.